Kentucky Sidesaddle – Promoting the art of riding aside and connecting enthusiasts. 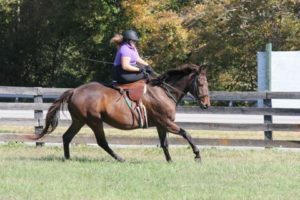 Kentucky Sidesaddle, also known as KYSS, is a riding and social club dedicated to promoting the sport, and art of riding sidesaddle. Victoria Nader and Tough Chukker captured by Susie Markley. host clinics, certify instructors, and network for saddles and educational materials. The current club “seat” is in Lexington, Kentucky, however we welcome members from all over Kentucky, and neighboring states. The 2018 calendar of events is filling up fast, and active members receive points toward year-end awards. Won’t you join us?